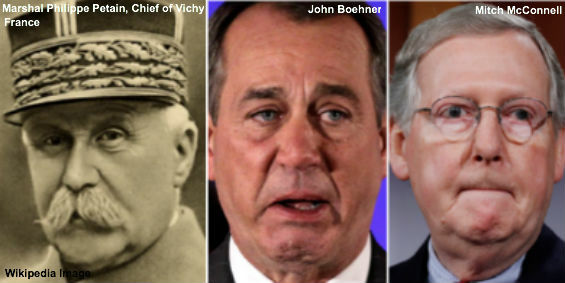 The Republican collaborators who forced through Congress the hated “CRomnibus” and not only voted with President Obama to destroy the quality of life for millions of American workers, but used their leadership positions to thwart conservative efforts to stop Obama, remind us all too much of the Vichy French government leaders of the World War II Nazi occupation era. Not only did they drop their rifles without firing a shot and run in the face of the enemy, they then joined the tyranny of the enemy in oppressing the patriots who wanted to keep fighting. And make no mistake about it; Republicans who joined with Obama to pass the hated “CRomnibus” did join the enemy. This isn’t a polite family disagreement over tactics or obscure House and Senate rules, this is an existential fight to the finish over the direction that this country, and the Republican Party, will take. Will the Republican Party remain the Party of grassroots conservatives, entrepreneurs and liberty-minded voters, or will it become – as it seems to be trending – the Party of Big Business and Big Government? Will Republican elected officials go to Washington to reform government and rein-in spending, or will they go to Washington to hold power for power’s sake? And will they follow their Party Platform and keep their promises to voters to stand for and govern according to conservative principles, or will they see what they say to win elections as merely words of convenience to get them what they want? These are fundamental questions that conservatives and liberty-minded voters must get answered over the next year or so – and the answers will come from deeds and votes, not words. And the pressure to join the collaborationists will be enormous and it will come from sometimes surprising places, such as often conservative columnist and thinker George F. Will. Well, this is how you get things done. Country clamors for bipartisanship, that's what it looks like. It's not pretty, and it's long and it's confused and yet another piece of legislation we had to pass in order to find out what's in it, but this is log rolling. This is how democracy in a continental nation gets things down. People aren't going to like it. We had the politics of futile gesture that has become bipartisan. Elizabeth Warren and Ted Cruz together at last. No one knows what they were trying to accomplish, but that doesn't seem to matter to them. Why is it that to Washington’s inside elite “compromise’ always grows government and spending? To insiders like George F. Will standing on principle has now become “the politics of futile gesture” and the impulse “to get things done,” even if those things are bad for the country. What Will and the other collaborationists like Speaker Boehner, House Majority Leader Kevin McCarthy, House Majority Whip Steve Scalise, and their Senate co-conspirators like Mitch McConnell, mean by “compromise” always ends up growing government, taking us many steps down the road to national bankruptcy and further eroding liberty and American exceptionalism. In a government of the insiders, by the insiders and for the insiders, the “compromise” is never to reduce spending by 10 percent instead of 20 percent, or to eliminate 10 wasteful programs instead of 20 – a Washington insider “compromise” is always to march at a slightly slower pace toward bigger government, national bankruptcy and the loss of liberty. As CHQ Chairman Richard A. Viguerie argued in his book TAKEOVER, the great fault line in today’s politics isn’t between Democrats and Republicans, it is in the Republican Party between insiders who reap the benefits of Big Government and those who want limited government according to constitutional principles. If advocating and defending the kinds of “compromises” found in the “CRomnibus” is not Vichy-style collaboration with the enemies of liberty and limited government we’ve never seen it. Speaker Boehner is the leader in the House of the Vichy Republicans and Vichy Republicans in the Senate are led by soon-to-be Senate Majority Leader Mitch McConnell. And just as in France in the 1940's their numbers of facilitators are legion and they are deeply entrenched. When the new Congress takes the oath of office in 2015, we look for Boehner and McConnell, and their legions of insider lobbyists, special interests and political consultants, to not just drop their rifles and run, but to revel in the power that comes with joining the tyranny of the enemy and oppressing the patriots who oppose CRomnibus-style compromises and wish to stand and fight for conservative principles and American exceptionalism. As in Vichy France in the 1940s there’s only one alternative left for conservative patriots who want to fight tyranny, and that is to form a resistance movement to fight behind the lines (figuratively of course) blowing-up trains, cutting telephone lines and undermining oppressors, such as Obama, Boehner, McConnell and their allies wherever they may be found. Submitted by Gerry on Mon, 12/15/2014 - 21:04. The only thing the elected officials compromise is their integrity. We are merely pawns to be manipulated so they can be re-elected to their positions of power. Submitted by OldBooger on Mon, 12/15/2014 - 17:30. I suppose the overwhelming defeat of the democrats was lost on Boehner and McConnell. The voters are not going to take this lightly. The pork in this spending bill is beyond any common sense. The "new congress" had better sit up and take notice then take action or the fed up voters may elect to take action on their own. Submitted by chaslie on Mon, 12/15/2014 - 14:31. All I can say is if the Republican Party continues down this road by 2016 I will no longer be voting Republican because I am tired of voting for a Party that turns around and stabs you in the back. I will be voting strictly for 3rd Party candidates. "The Die is Cast !! We have crossed the Rubicon !!" Submitted by sir_aslan on Mon, 12/15/2014 - 13:38. Casablanca Vichy versus Patriot !! Already wrote letter to Editor of Findlay Courier because Rep Bob Latta needs to be primaried ! !